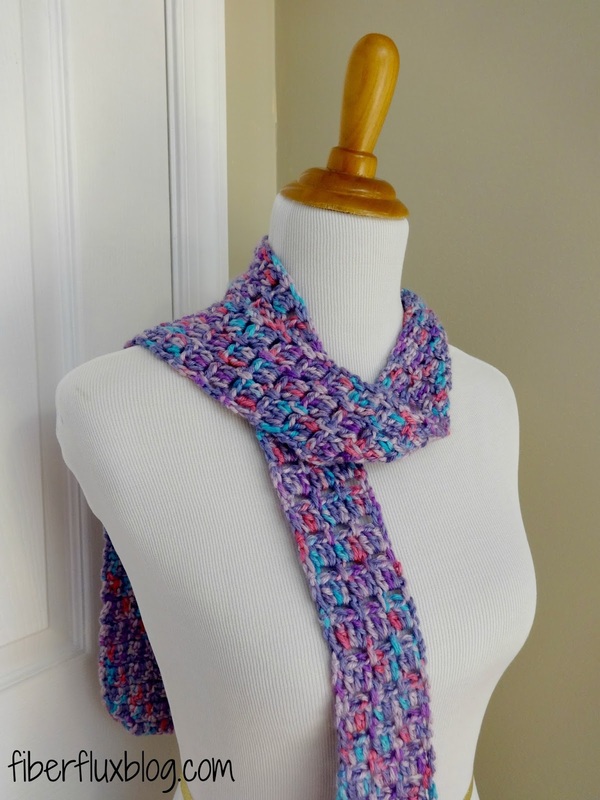 Fiber Flux: Free Crochet Pattern...Sugar Violet Skinny Scarf! 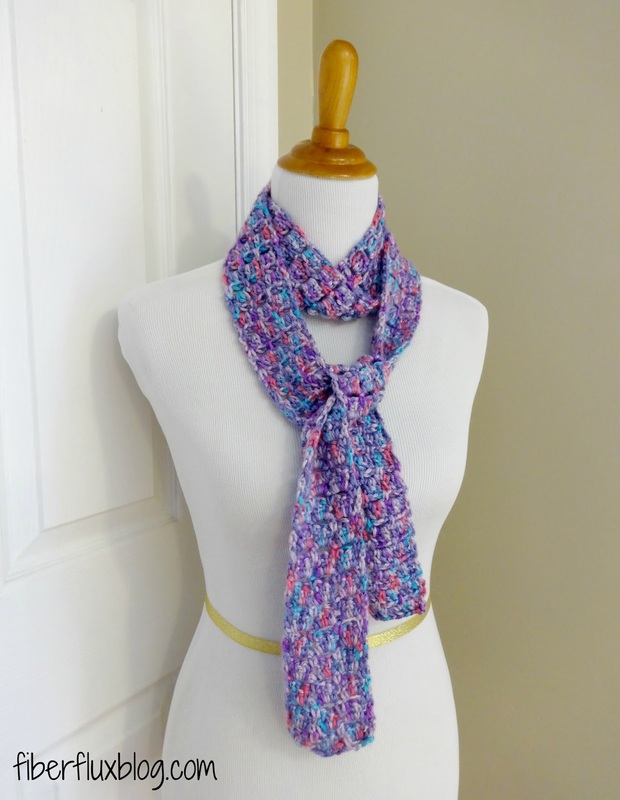 Free Crochet Pattern...Sugar Violet Skinny Scarf! 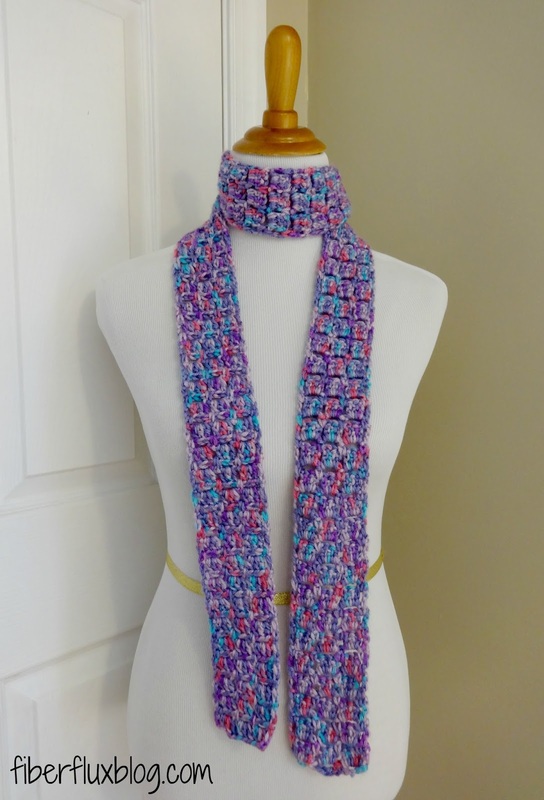 The Sugar Violet Skinny Scarf is a beautiful, soft, and colorful scarf that is crocheted in a simple two row stitch sequence and compliments the lovely variegated yarn. It can be worn any time of year, and is great for warmer weather when you need a little something, or cooler months as an accessory scarf. Length: 72 inches as shown. However you can make yours as long or as short as you like. Foundation Row: In the second ch from the hook, work a sc. *Ch 3, skip 3 ch, sc in next ch, rpt from * to end of row. Row 1: Ch 3 and turn. *Work 3 dc, ch 1 in the ch 3 sp from the previous row. Rpt from * in each ch 3 sp across. 1 dc in the turning chain. Row 2: Ch 1 and turn. In the first space, work a sc. *Ch 3 and work a sc in the ch 1 space (in between the groups of 3 dc from previous row), 1 sc in the turning chain. Repeat rows 1 and 2 until scarf is desired length. 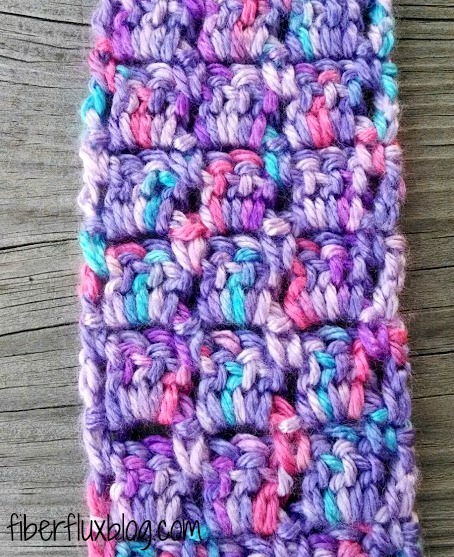 I really like this pattern...but have a question? Can you make this pattern wider? How many chains would you start with to make this scarf 4 inches wide? Joann... I wanted to make mine wider also. It seems that the pattern is done in multiples of 4 + 2. I crocheted mine with a starting chain of 18. Depending on how tight or loose you crochet, you could start with 18, 22, 26 etc. Hi Sassy~ Thank you so much. I've got the yarn and now with your help I'm ready to begin this project. I kept checking back and glad I did! You help is greatly appreciated...Joann.